The firefighting foam believed to be the cause of well contamination south of the Martha’s Vineyard Airport is a newer version of a foam used for decades to extinguish flammable liquid fires, especially those involving petroleum products. Aquaeous film-forming foam (AFFF) is extremely effective in high-hazard situations because the foam creates a vapor barrier that prevents liquids from being reignited by contact with the air. For that reason, it is commonly used in chemical plants, on oil tankers and refineries, and was mandated for use at commercial airports by the Federal Aviation Administration, including for training. There has long been concern about the health risks of a chemicals used in firefighting foam. An earlier version of the foam containing perfluorinated compounds, PFOA and PFOS, was discontinued in 2002, and Massachusetts has launched an initiative to help dispose of that legacy supply. But a newer version of the foam containing per and polyfluoroalkyl (PFAS), manmade fluorinated carbon-chain chemicals, was thought until relatively recently to be safer. 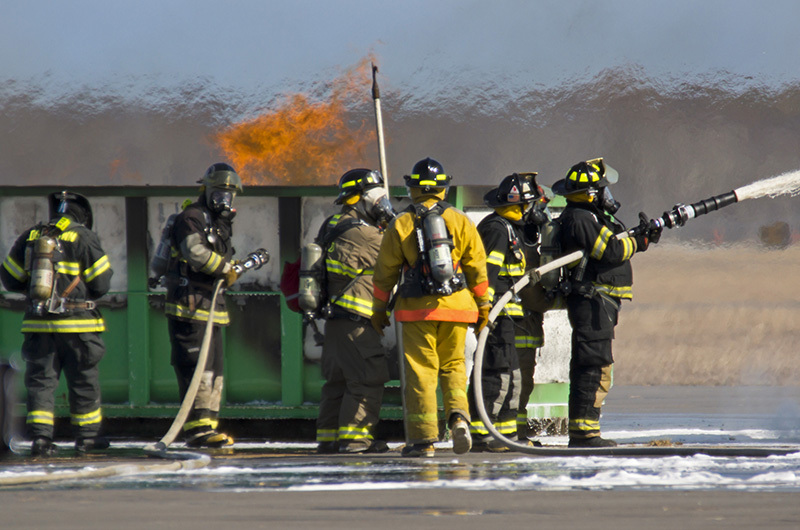 In July, Washington became the first state to outlaw PFAS-containing firefighting for training, and in October, Congress passed legislation directing the FAA to allow airports to use firefighting foam that does not contain PFAS. Tisbury fire chief John Schilling said Island firefighting departments use a different foam that is distinct from the PFAS-containing Class B foam. “We’re not fighting jet fuel, so we don’t carry the same product they do. It’s been extensively tested and approved . . . and is an environmentally safe foam,” he said. Tisbury does have one trailer full of 500 gallons of Class B foam in case of a fuel fire in Dukes County. This is a state requirement, Mr. Schilling said. “In my tenure as chief, I have never had to use Class B foam,” he said. Novacool UEF, manufactured in upstate New York is a bio-degradable firefighting foam that quickly and efficiently extinguishes Class B fires. It uses a fraction of the amount of concentrate and once the fire is out it stays out.